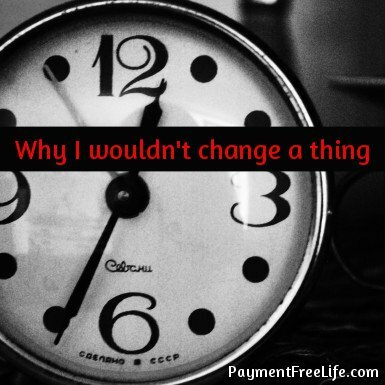 Payment Free Life - What could you do if you had no payments? I recently wrote a post about Wal-Mart’s Savings Catcher App and while I love it, my favorite app is still Target’s Cartwheel. There are so many reasons why this one is my favorite. If you shop at Target and aren’t using it, you are missing out on huge savings! Out of all the savings apps I use, I have been using Cartwheel the longest. I use it every time I go into the store and I save almost every time I’m in the store. The Cartwheel app works differently than most of the apps on the market because the savings are instant. I don’t need to scan my receipt and then cash out my savings. The savings come right off your total at the register, just like the Target debit card. While I shop, I can search for items that I need to purchase to see if there are savings. I like this because I don’t need to scan through all the offers and risk impulse buying something that is not on my list. Sometimes there are multiple brands with discounts so there is some choice. There are often discounts available on a name brand and one of the Target brands (market pantry, archer farms, and simply balanced). You can see from my graphic, there are over 300 food offers alone. Some of the savings are pretty significant. I’ve gotten up to 25% off some of my purchases. The lowest discount I’ve seen is 5%. Staples like milk, eggs, and bread are almost always on sale through Cartwheel. There also are not limits on the number of items you can purchase. Target often stacks the Cartwheel offers with things that are already on sale and with coupons available on their website. Before I leave home, I check the weekly flyer and the Target coupon section, then I search Cartwheel as I walk through the store. Cartwheel doesn’t stop in the grocery section. There are discounts all over the store. A few weeks ago, I went to Target to get a new shower curtain and liner. When I got to the store, I realized that both of these items were 15% through Cartwheel. When I got home, I realized I had forgotten to get new hooks for the shower curtain. The next time I went into the store, those were 20% off with the app. Things change every week so I always search for things on my list. Just because it wasn’t in the app the previous week doesn’t mean it won’t be there next time you go. I also love that once I add something to my savings list, it stays there until it expires. I frequently by milk, bread, and canned tomatoes at Target. Those three items are always in my offers because they rarely expire. I don’t have to think about adding them each time I shop. I am limited to 20 items on my savings list but that is rarely a problem, especially when I have a list of things I need to get in the store. While I love the surprise savings I get from Savings Catcher, I love knowing how much I am saving and getting those savings immediately. If only we had a Super Target nearby! This app is available for iPhone and Android. If you don’t have a smart phone, you can also add your offers via computer and print your Cartwheel bar code. Your bar code never changes so you can cut it out and stick it in your wallet and use it every time you shop, even when the items on your shopping list change. That’s a little trick I learned from one of the cashiers when I was having trouble with my phone one day. 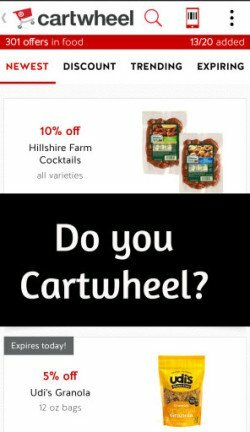 Do you use the Cartwheel app? How much have you saved? I really don’t like dealing with coupons anymore. Having to hunt them down, print them out, keep track of them all. It’s just annoying. Lately, I’ve been looking at different savings apps to see if there was a better way. I’m happy to report that there is! Over the next few weeks, I’m going to review a number of savings apps that I think are worth the download. One of my favorite apps is the Wal-Mart Savings Catcher. I hate having to go to multiple stores to get the best deals. I don’t want to hunt through multiple circulars and spend a whole day tracking down the best deals at each store. The Wal-Mart Savings Catcher does all the work for me. It’s simple. Purchase your items at Wal-Mart, scan your receipt and the Savings Catcher does the rest. The app checks the sales circulars for all the stores in your area. That includes grocery stores, pharmacies, and Target. If the app finds a lower price, you get a credit for the difference. This credit can be placed on a Wal-Mart e-gift card. The gift card is then emailed to you so you can use it next time you are in the store. On my last shopping trip, I saved $1.31 on my purchases. It’s not a lot of money but when combined with the other apps I use, I saved $3.31 on that small trip. The only downside is that you don’t know what you are going to get credit for unless you know an item is on sale somewhere else. For example, I bought coffee and ended up receiving 80 cents off the coffee. Had I known it was a deal, I probably would have bought more. It was a nice little bonus for buying things I needed any way. If you shop at Wal-Mart, get the app. It’s available for iPhone and Android. If you are shopping anyway, you might as well upload your receipt and see if you’ve got some extra savings! UPDATE: You do not need a smart phone to use the Wal-Mart Savings Catcher! You can actually enter your receipt information right on the website. 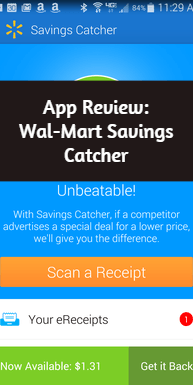 Do you use the Wal-Mart Savings Catcher App? What’s the largest savings you have received on one receipt? Our debt free journey has been a long one. We started our journey in 2008. It’s been a long seven years. 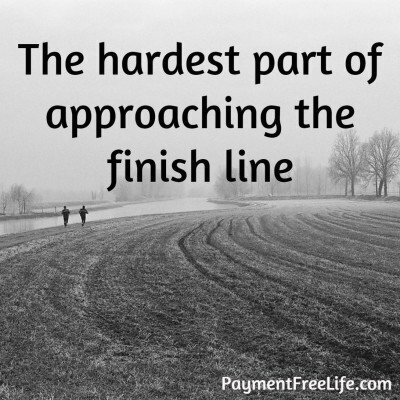 Now that we are approaching the finish line, we have also entered the most difficult part of the journey, making it to the end. We started this marathon with over $220,000 in debt. We have paid off over $158,000. It started slow but as we cut our budget and increased our income, we started making huge progress. We faltered a bit after we paid off the credit cards but we got back on the track and started running again. We have $62,071.23 left and it is becoming more difficult to stay motivated. When we started our minimum required payments were over $2,000 per month. That was a tremendous amount of money, especially since we were making about half of our current income. Today, our minimum payments are $436.48. It’s easy to get into a false sense of security. When I make those large debt payments every time we get paid, I think of all the things we could do with that money. $436.48 per month isn’t a lot. We could swing that even if one of us lost our job. We should ratchet up our savings, go on a trip, buy my husband a car. There are so many things we could do with that money rather than sending it to the stupid bank. Then I remember the outstanding balance. $62,071.23 hanging over our heads. It’s like a weight holding us down. While $436.48 doesn’t seem like a lot of money, $62,071.23 sure is. It’s keeping us from fully following our dreams. It is risk that we just don’t want to have. Next to my desk, taped to the wall is our debt snowball from when we got back on track in August 2013. It is a reminder every day to keep me on track. It not only reminds me where we are now, but also where we have been and how far we have come. While I enjoy the sense of security that I have from paying down the debt, I’m fairly certain that I will love the sense of security when that debt is completely gone. 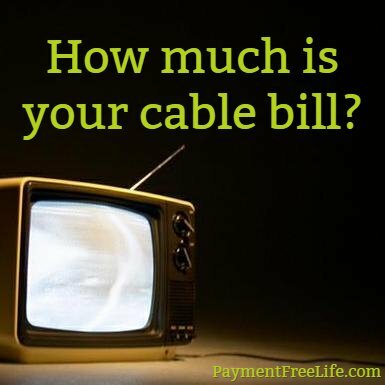 How much is your cable bill? Sometimes, I really feel like I am out of touch with the rest of the world. Living in my frugal corner of the world, I am sometimes shocked by how much people are willing to pay for things. Cable bills appear to be one of those things for which I am COMPLETELY out of touch! Before Christmas, I was talking to a small group of people about internet speeds. I said we have 105 mps because of the businesses that we run out of the house. Someone asked how much I pay for that. It costs $76.50 per month. Apparently, people were impressed with that. I got a lot of “Wow! That’s pretty good” reactions from people in the group. So I asked what other people were spending. The answers varied from $240 to $310 per month! Seriously??? My jaw clearly hit the floor because a number of them reassured me that the amount they were spending was for TV, internet, and phone service. My gaping mouth was left unchanged by those reassurances, so I was asked how much I pay for all these services. Well, $76.50 covers the internet and we get free basic cable (probably because we cancelled our cable TV for over a year). We have Ooma for our phone. That costs another $3.82 per month. So that’s about $81 per month. Now, their jaws were ajar. Oh, and we have Amazon Prime to stream TV shows and movies. They all had Prime as well, in addition to their $240 to $310 per month cable bill. I thought, this can’t be normal. This is just a few people. As we moved to a larger group of about a dozen people and the discussion continued, apparently this is very normal. Everyone in the group, except for me had TV, internet, and phone bills that were well over $200 per month. I got upset when my bill went to $92 per month! I cancelled the cable TV portion and got an antenna to watch football and PBS. Previously, we had Netflix or Hulu in addition to Prime, but I didn’t want to spend the additional $8 per month. Plus I have more things in my Amazon queue than I will be able to watch in a lifetime, so I’m good with one service. I’m not sure how I would react if I got a $240 cable bill. Actually, I’m pretty damn sure I know how I would react. Maybe I’m just completely out of touch but $240 per month is a lot of money. That’s over half my grocery budget. Over the course of a year, that’s a pretty decent vacation. An extra $160 placed in a retirement account at 8% for 30 years would be $234,904.14. Yup. That is a lot of money to give up to watch Swamp Stars or The Real Housewives of King’s Landing. Help me out here guys! How much are you spending each month for these services? Do you still have cable TV or have you cut the cord? I promise you that as soon as Comcast tries to charge me for cable, we will cut that cord again! Am I just completely out of touch? There is nothing like a year end review of your finances to give you a bit of a heart attack. This morning, I went through all my old budgets to calculate how much we’ve paid in debt and interest in 2014. It’s interesting to get an annual view, especially when you are making goals for 2015. If you want to do your own review and don’t have budget sheets handy, just go back to you bank statements and add up all the payments you made to creditors. If you check your final statements for 2014, they should list how much you paid in interest to each of those creditors. Since we only had four debts left in 2014 and three of them are involved with our taxes, I needed to get those numbers anyway. Last year, I didn’t do a full debt roundup but I did calculate the amount of interest we paid in 2013: $6,990. So how did we do in 2014? In February, we paid off my car. Total paid on the car in 2014: $10955.80. In June, we paid off my husband’s student loan. That month our total debt dropped below $100,000. Total paid on Jeff’s student loan in 2014: $21,433.32. In July, we started hammering away at the home equity line. My goal is to have that paid off by the end of February. Total paid on the home equity line in 2014: $31,772.60. If you include interest, we paid $71,352.98 on four debts. We paid $5,418.56 in interest. That means we paid off $65,934.42 in debt in 2014. When I first looked at all of those numbers, I was a bit shocked. That’s a LOT of money. We also did some work around the house, had some significant car repairs, paid some vet bills for one of our cats, made some investments in our business, made our tax payments, and increased our savings a bit. We were able to do all that and still pay almost 52% of our take home pay in debt payments. This also helped me confirm that we can pay off our remaining debt in 2105. Our current balance is $64,504.21. That consists of $15,649.97 on the home equity line and $48,854.24 in student loans. If we were able to make $71,352.98 in payments in 2014, we should be able to do that again in 2015 as long as I can find another teaching contract or find other ways to increase our income. We are already looking at the later just in case another teaching contract does not come through. This has also made me start thinking of all the awesome things we will be able to do once we are debt free. We should be able to pay off the house in a few more years. We will be able to increase our retirement contributions and give more. We will also be able to start traveling again. While these numbers gave me a few heart palpitations, they also gave me hope for the future. 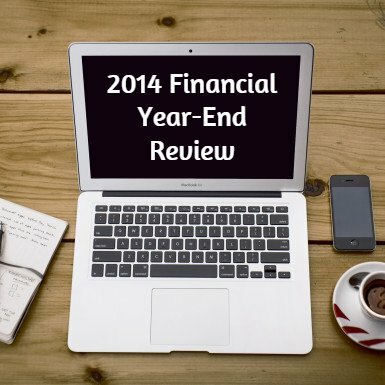 Have you done a financial review for 2014? Have you made financial goals for 2015? Today, I turn 35. Over the past few weeks, I’ve been thinking of the past as I set goals for the future. Thinking back to some wonderful memories and some not so wonderful ones, I often think if there is anything I would have changed along the way. There have been times along this journey where I have questioned my decisions and cursed myself for some of them. I have been frustrated with things that have happened in my life and tried to wish them away. As I turn 35, I realize that all of those things have made me the person I am today. Every decision, every trial has shaped me, has put me in the spot I am at this moment. Even my cancer diagnosis eight years ago threw me on a new course in life. It made me realize how much I loved the man I married. It opened up a new career path which I truly love. It put me on a course to start my business, to teach people all over the world through my YouTube videos, to mentor students and change lives, to start this blog. Most people would think, at the very least, I would wish to erase cancer from my history. But even that is so tightly woven into the person I am today that, even though it haunts me, I would not erase it from my life. I would not erase our debt either. I’m not sure who I would be if we had not had to dig ourselves out of the massive debt we created. Has the journey been less than pleasant at times? Oh hell yeah, but it has also been an amazing experience. Over the past 17 years, I’ve learned that I am stronger than I ever thought possible. I quit a good paying job when we had mountains of debt because I put my health first. I held my bald head high in a room full of business people as I started my accounting firm. I stood in front of a classroom, scared to death, to share my knowledge and experience with students, some of whom older than I was. Together, my husband and I have paid off over $155,000 in debt when it would have been easier to just give up and declare bankruptcy. We stayed together and fought together when many times it would have been easier to just walk away. As I sit back and reflect on all those moments and wonder how things would be different, I realize that it’s not worth the chance. Even changing one small thing might make everything else completely unrecognizable. It’s just not a chance I would be willing to take. I am a product of ALL of life’s experiences: the good, the bad, the amazing, and the pretty damn crappy. Here’s to looking back in another 35 years and still being at peace with all those life experiences. Should I use the emergency fund? 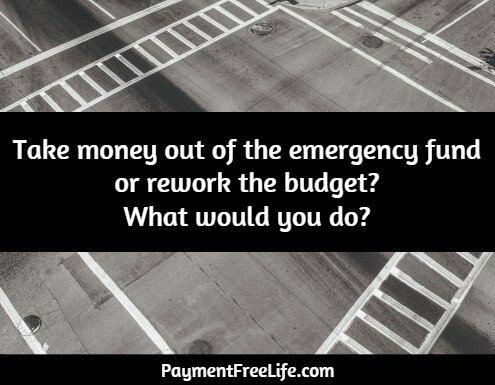 I got a great question from Eileen about using the emergency fund versus trying to cash flow an emergency. Do you ever find yourself reluctant to let go of the savings you have available because you’d like to see that number grow (maybe as much as you want to see others go down)? For instance….in the months that we have an unexpected expense, I tend to just try to absorb the extra expenses without hitting our emergency fund (or other cash funds) I try to cut back the existing budget and most of the times I know when it makes sense to do that vs pulling out some saving, but other times I end up cutting it close on fixed expenses and then I end up moving money out of the emergency savings anyway. I’m not sure if I’m making sense…but it’s like this fixation of NOT touching an emergency fund (or our “household” acct — for minor but not typical expenses). I’m not sure what is better from a mental standpoint. I hate touching my emergency fund, too! We always try to cash flow emergencies out of our budget when we can. The way I see it, if I take the money out of the emergency fund, I will need to make refilling the fund my top priority next month. That means that I will need to cut back on my debt snowball next month to put the money back into savings. For me, taking money out of savings is a mental trigger. It causes me to worry a bit to tap into that account. It’s my financial security blanket. I like having that money there just in case. I also worry that if I get in the habit of touching the account, one of these days, I might touch it for something that really isn’t an emergency. We were forced to use our emergency fund this summer when one of our cats got sick. It was the end of the budget cycle and I just did not have the funds to reallocate to the emergency. It gave me such peace of mind to know it was there so we could deal with the stress of losing one of our cats without having the financial stress as well. The first thing I did in the next budget was replace the funds in savings. Honestly, there is no right or wrong answer to your question. The thing I love is that you are being intentional with your money. You are evaluating what is and is not an emergency and you are trying to absorb the cost before touching your savings. Eileen, you are doing an awesome job! What advice would you give Eileen? How do you feel about touching your emergency fund? I’m usually pretty good about paying attention at the register. I watch as the cashier rings up my order. Over the years, this has prevented me from overpaying for things. 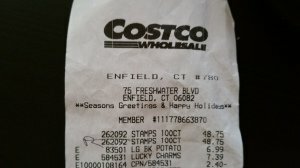 Because of Connecticut law, I have actually gotten a few grocery items for free. Well, Friday night I wasn’t paying attention and it almost cost me $48.75. We were at Costco picking up a few things to bring to a friend’s house for dinner. There were also a few things we needed for the house and well, it’s Costco. It’s a very dangerous place to go without a list. Cereal was on sale. We also picked up some Christmas candy for the stockings (we have really big stockings!). As we walked into the store, I remembered that I needed stamps for the Christmas cards. I grabbed the huge cardboard placard that you need to bring to the register when you buy stamps. One more thing off my to-do-list. Win! After buying everything that we needed and a few things we didn’t, we headed to the registers. Jeff and I were talking about all the things we needed to get done and other stores we needed to go to before going home. I swiped my debit card without even looking at the total. The cashier gave me my stamps and the receipt and we were off to the next store on the list. I looked at the total: $162.56. Well, it was less than $200 and for Costco that is a huge win. Later, as I was taking a picture of the receipt for an Ibotta rebate, I noticed I had been charged for two books of stamps. I was really pissed. Not at the cashier. Not at the guy at the door who checks the receipts. I was pissed at myself. I couldn’t believe I missed it. Almost $50 and I missed it. Hell, the stamps were the first thing on the receipt and I still missed it. 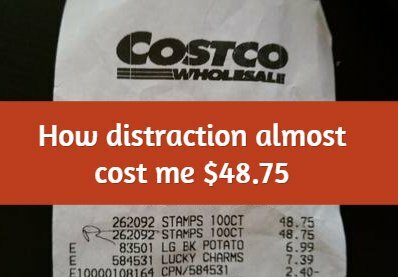 On Saturday, we went back to Costco and they gave me my money back. I’m pretty sure if this had happened at another store, I would have been out of luck. After all, how do you prove you didn’t receive something? I was so grateful I could have kissed the woman at customer service. So I got my $48.75 back and what did I do? 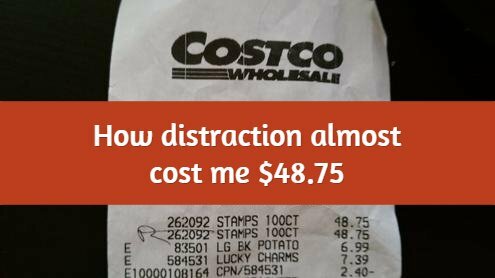 Spent it at Costco! Well, at least we have groceries for a while! Has this ever happened to you? Were you able to get your money back? How do you stay focused at the register? With all my goal planning for 2015, I’m trying to get myself on a more regular schedule. This is difficult because as a college instructor my schedule is different each day. Still, I know I can do better. Today is the first day of doing better. Today, I woke up at 5:30 because this is the time I need to get up on my early days. This is often difficult on Wednesdays because I usually teach until almost 10pm on Tuesdays. Yup, Tuesday is my early day and my late day. Oh joy! But today, I did it. Now I wasn’t very productive for my first half hour. Actually, I wasn’t productive at all but that first half hour allowed me to get my bearings and do a bit of planning for the day. The first think I noticed was a pile mountain of dishes. 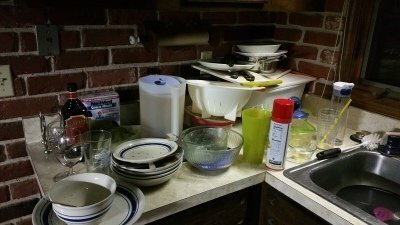 The reason we have so many dishes is because we have been eating at home a lot (frugal win!) and have been very busy working on projects to bring in extra money (yay money!). That leaves little time or concern for dishes until they are about to leap off the counter and attack you! That was a very scary thing to see at 5:30 in the morning. First thing on my list: dishes. I started the dishes at 6:00. It didn’t take long and the after shot is much better. 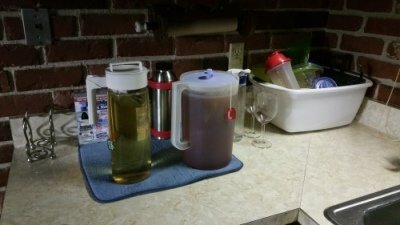 I also started some iced tea. Making iced tea saves us a tremendous amount of money. I always fill up my water bottle before leaving the house. My husband drinks black tea and I drink green tea. You can purchase large tea bags at Wal-Mart so you aren’t dealing with a ton of little bags. By 6:30, the dishes were done, tea was steeping, and I had coffee in my hand. My next order of business was to get our finances updated. My husband gets paid biweekly on Wednesdays and today is pay day. I typically update our check register and budget on the days he gets paid. I entered all the transaction since the last time I updated the check register and added Jeff’s paycheck to the balance. I then added any bills that would come out of the account over the next two weeks. Since most of our bills are due at the beginning of the month, I made a $2,000 debt payment on our debt snowball. This brought the balance on the home equity line to $19,460.02. I was doing a happy dance to see that balance drop below $20,000. In July, the balance was almost $47,000. I still have another $2,700 to pay toward the snowball before Christmas but that will happen next week when I get paid. By 7:00, I was done with the personal finances. I took a few minutes to chat with an old friend who was also up and running fairly early. By 7:30, I was out of the shower and dressed for the morning portion of the day (A.K.A. jeans and a hoodie). I went back down to my office to get my company’s books updated since I deposited some checks yesterday. 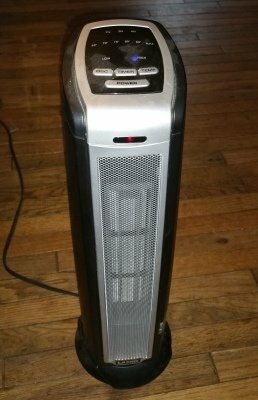 Instead of turning up the heat in the entire house, I used my space heater . I didn’t notice all that dust before I took the picture. It’s interesting what you see when you use a flash! I dusted it after I took the shot, but I wanted you to see how things really are around here. I am probably the world’s worst housekeeper. Oh well. The space heater saves me a ton of my gas bill and keeps my office nice and toasty. I just love it, dust and all. We are still on budget for Christmas. I hate shopping so I’ve been doing most of mine on Amazon . I have picked up some great lightning deals and since I have been shopping early, I am also building up media credits. Amazon has an interesting offer for Prime members. If you are a Prime member, you get free two-day shipping. However, Amazon will give you a $1 media credit if you opt for slightly slower shipping. These credits can be used for books, music or movie rentals. I have built up a bunch of these credits and I’m still getting my packages in 2-3 days. Win-win! It’s now 9:30. I feel like I have accomplished a lot this morning. I don’t need to leave for school until noon and my chores are already done. I’ll probably end up writing some more content for my other website, Accounting In Focus and work on my goals a bit more. 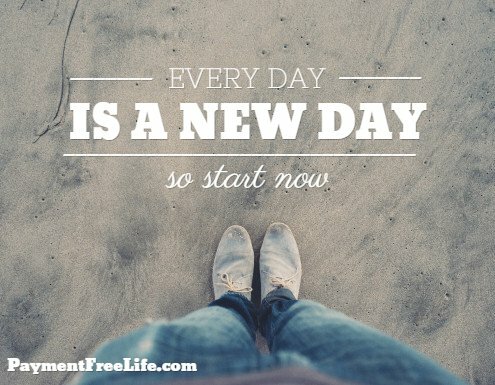 Do you feel more productive when you get things accomplished early in the day? What frugal things are you doing to stay on budget this month? What are your 2015 goals? You probably think I’m crazy. We haven’t even made it through the holidays and I’m jumping to New Year’s resolutions. There is so much to do right now, who has time to think about goals? I know what you mean. This time of year is so busy. We are all running like crazy people trying to determine the best gifts for our loved ones, cooking food that will cause us to need a diet resolution, and rushing from one holiday event to the next. Really, I get it. Stop for a moment and take a breath. Maybe have a glass of wine. I know you are busy but it is time to be intentional about your life. It’s time to make goals and write them down. It doesn’t take long. It took me just a few minutes to think out what I wanted to do in 2015. The planning part can take place over the next few weeks. This initial part is to just create some goals. Maybe you want to pay off your car or a student loan. Maybe you want to save a 3-6 month emergency fund. Maybe you want to eat at home twice a week to save some money. See? Quick but specific goals. This doesn’t have to be rocket science. I just want you to jot a few things down. They could be financial goals, career goals, health related goals, relationship goals. Why write them down? Because you are much more likely to achieve your goals if you write them down! Don’t wait until January 1 to set some resolutions. I swear just using the term “resolution” increases your chance of failure. 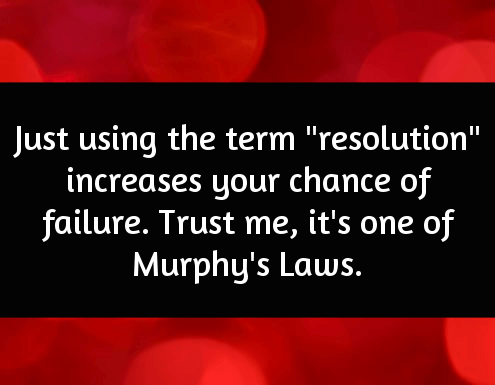 Trust me, it’s one of Murphy’s Laws. Pay off our remaining non-mortgage debt, current balance $70,467.39. Build a 3 to 4 month emergency fund or approximately $15,000 in savings. Launch my first online course by May 2015. Help my husband publish his first book by July 2015. Attend the Launch Out Conference in June. Attend the PLF Live Conference (no date announced yet). Blog about our debt free journey. These goals are fairly specific. Jeff and I also have more detail on some of these and action steps for what we need to do. That seems insane crazy to pull off the rest of the debt and the emergency fund but I think we can do it. It will rely on the course and book launches being successful. The ten pounds is something I just really want to do for me. 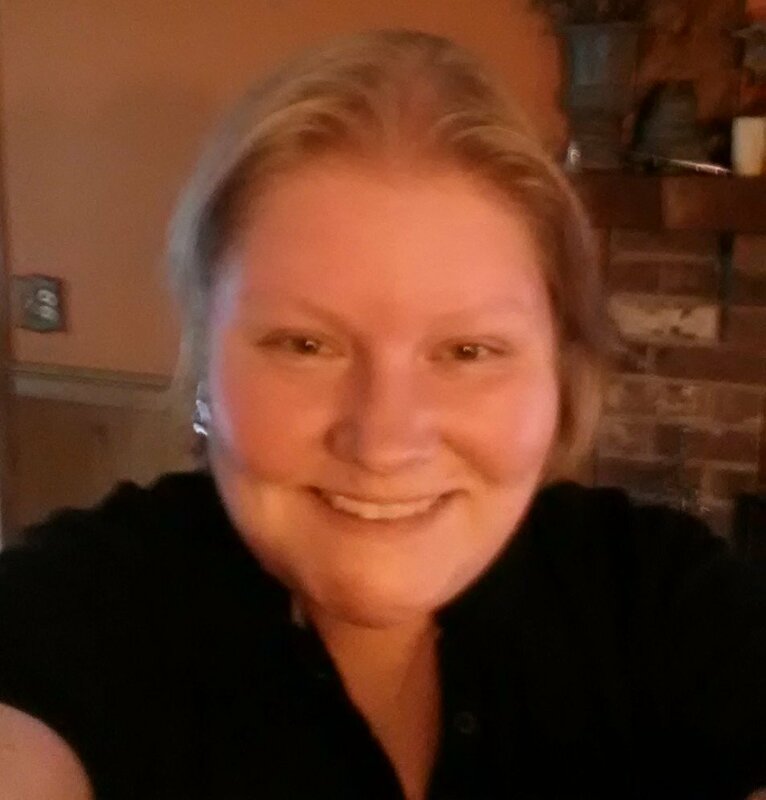 A few years ago, I lost 22 pounds and I have been hovering between 204 and 207 for over a year. I am done with that. I want to get below 200 and stay below 200 with daily fluctuations. I don’t have a plan yet but that will come soon (any ideas are welcome!). I need your help to hold me accountable. I am going to spend most of 2015 discussing the daily tips we use to save money. Some big things, some small things, and our mindset that has kept us going this long. I’ll probably drag my husband in now and again to help document the last leg of this marathon. Blogging helps keep me on track. It’s amazing how much more grounded I feel after writing a post. You guys are awesome for that! I also want to help hold you accountable. If you haven’t already done so, sign up for my email list. I will be emailing you all periodically to see how you are doing on your goals. You can sign up at the bottom of this post. For now, what are some of your goals for 2015?